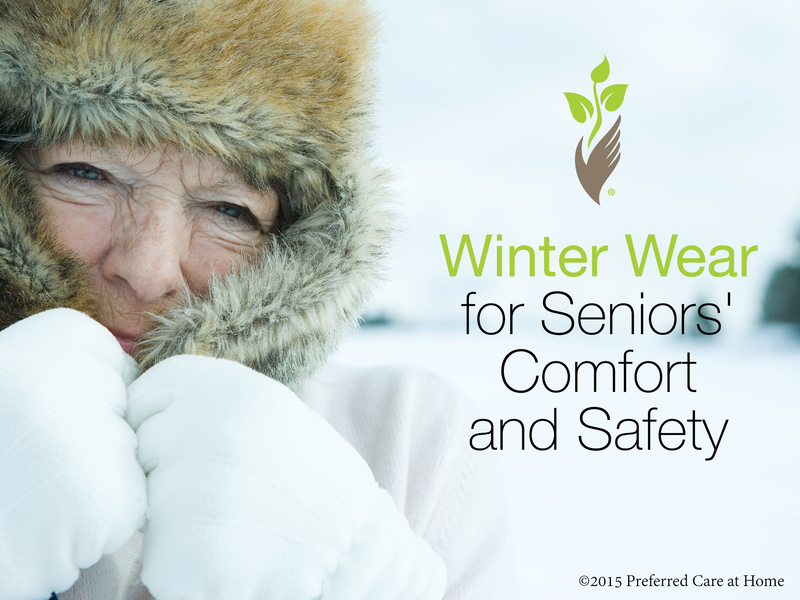 In some parts of the country, this winter has already set records for cold, ice, and snow, so seniors and caregivers should be conscious of a few basic rules for cold weather attire. Luckily, the layered look is in fashion year round, but more importantly layering is essential in cold or windy environments. The concept is to trap warm air near the skin, but allow sweat to evaporate. As people age, they tend to lose subcutaneous fat; their metabolism slows, and circulatory problems are commonplace. Warm comfortable clothing is not just a good idea, it is essential. When indoors, at least two layers of clothing should be worn. This is not only a healthy habit, but cost saving when you reduce the temperature in your home. In addition to lowering the monthly utility bill, the body’s metabolism is affected positively. Furthermore resistance to respiratory ailments is improved when your nose, throat, and lungs are not continually subjected to hot, dry air. For the primary layer, right over the skin, most people prefer cotton. Some are sensitive to rough wool garments or socks, although advances in blended fabrics have resulted in the resurgence in the popularity of wool. The primary layer should fit snugly, but not too snugly, as to reduce or cut off circulation especially in the case of tight bands on socks. The second layer should cover the torso and most of the arms and legs. This layer should be loose and comfortable, but for optimal heat retention, the second layer should be within one- quarter inch of the skin. The second, or middle layer, must allow moisture to escape. It does not need to be heavy. Remember that the primary purpose of this layer is to trap heat and absorb moisture. Any additional layers should be loose and non-restrictive. When outdoors in inclement weather, it is optimal to wear at least three layers of clothes. The outer garment should be selected in consideration of the weather conditions, and not other criteria. Unlike cotton and most other materials, wool remains warm and comfortable even when it is wet. Often great care is taken to adequately cover those parts of the body which retain heat the best, and neglect parts of the body that retain heat poorly, such as the hands and feet. These body parts have a high surface to volume ratio: they generate less heart, and have almost no insulation. Many seniors have poor blood circulation. All these facts mean that extremities lose heat more quickly and get cold faster. This outcome is unhealthy for most adults and dangerous for the elderly. Doubled socks, adequate footwear, scarf, and cap are more than just prudent when venturing outside. In the busy world of the caregiver, it is common to need to rush from your home for an appointment or other needed task. Think twice, slow down, and bundle up! You won’t regret this choice. A bit of preparation for the elements could mean the difference to you and your senior loved one.